The three cities each have their own distinct architectural styles, another fact which makes a visit to the Tri-city all the more interesting. From Gdansk’s rebuilt Hanseatic old town through Sopot’s late 19th and early 20th century Secessionist or Art Nouveau influenced villas and Gdynia’s 20th century Modernist style with its buildings heavily influenced by the ships in the nearby harbour, the Tri-city has a lot to offer those interested in architecture. There is one style and period, however, which is often overlooked and the creations of which are today ignored and unloved. The post-war Modernist style is largely unloved for a few different reasons. First of all, this style represents the communist era and is disliked by many for that alone. Others see the style as ugly, unfeeling and harsh both in style and types of materials used. Quite often the quality of materials used was sub-standard, due to economic considerations, and this has resulted in already difficult to love buildings becoming eyesores as they have deteriorated and not been maintained. The post-war Modernist style is something that connects the three cities though and each has its own examples, which are worth searching out. Some of these buildings are slated for demolition although there appears to be a growing campaign not just to prevent some from being demolished but instead to have the buildings listed and properly restored to their 1950s, 1960s or 1970s glory. A number of Poles have recognised that, love them or hate them, some of their communist era buildings were considered revolutionary and cutting-edge designs at the time they were unveiled. It has also been realised, possibly through the loss of other such buildings around the country, that these buildings represent a period of Poland’s history that cannot simply be airbrushed from memory. Many older Poles are increasingly nostalgic as well, maybe not for the government of that time, but for the memories they have of the period. 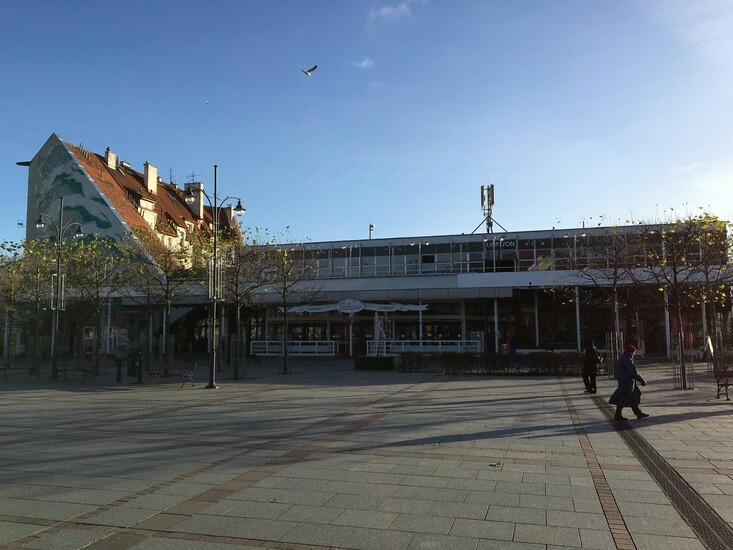 Finally, new developments such as the one in lower Sopot, have met with quite a bit of local criticism for a perceived lack of character and not reflecting the atmosphere of the city. The new developments have sometimes rekindled love for the old, dilapidated buildings of the post-war period. Here are some of the better known example of post-war Modernism in the Tri-city. Some are detested; some rather loved, but most are in need of investment. It might be difficult to image but the block at the end of Monte Cassino in Sopot that today houses, among others, the restaurant of famous Polish chef Adam Gessler U Kucharzy and club of rock star Nergal, was once considered a remarkable piece of design and its opening in 1960 was hugely anticipated. 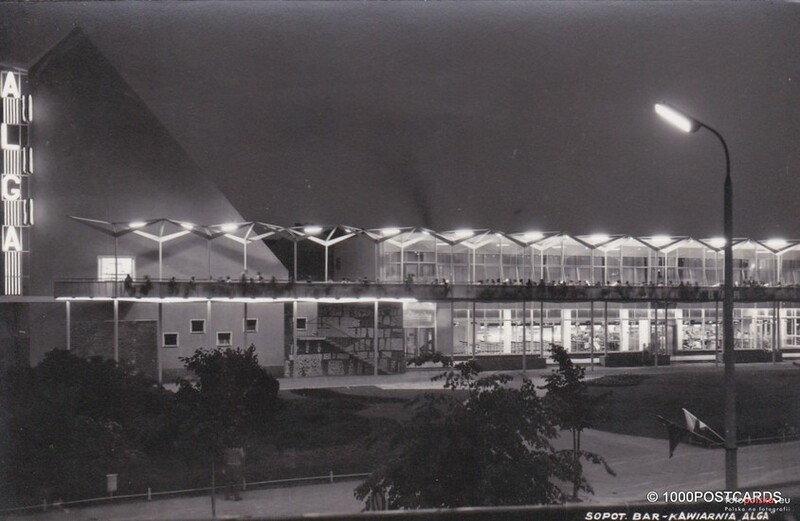 Towards the end of the 50s and the start of the 60s there was a growing demand for buildings to serve the retail and dining sectors to the point that the Ministry of Internal Trade ordered that efforts be improved in this sector. 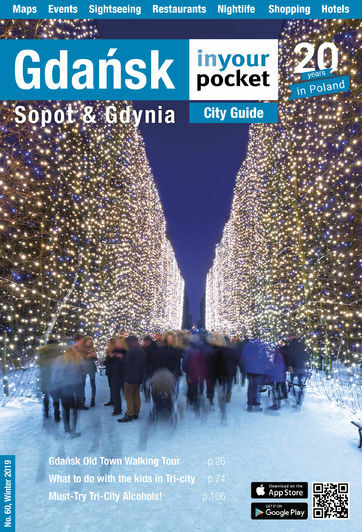 Public design competitions were held in department stores and dining halls around the country and Sopot, a rapidly growing tourist city, was earmarked for one of the new designs. 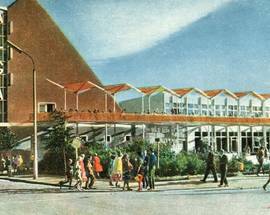 Much like now, the existing cafes and restaurants were located in the small street level units of the main street’s residential buildings, so the architects Jan Cichy, Bronisław Gawryluk and Andrzej Sierakowski tried to come up with something that was larger, could handle more guests and reflect the newer styles and trends in global architecture. It’s worth noting that post 1956 there were more freedoms and architecture was at the forefront of this new expressiveness. 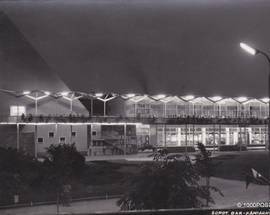 The new pavilion was opened on July 4, 1960 and named Alga after a public consultation (names suggested and rejected included Atomowa, Sodom and Gomorra and Papu-Papu). The new pavilion was an instant hit with people flooding to visit and to eat there. The building operated on two floors, both of which were open plan with lots of light thanks to the large windows on two sides. 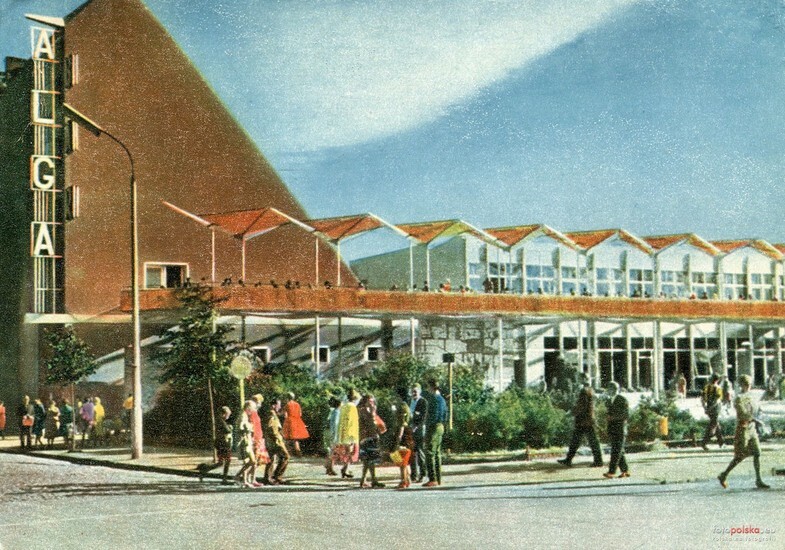 Unlike many projects in Communist Europe, the architects’ designs were not later compromised because of a lack of funding or materials. If you stand back and look at the whole building it is still possible, despite the ravages of time, the destruction of the original concept and the plethora of signs, to see the two elements of the original project. First there is the main building – the white, two-storey cuboid which makes up the main part of the building. In front of the building were two terraces, the upper terrace detached from the main building and connected by three bridges. The upper terrace was covered by the design feature which was the most striking characteristic of the Alga Pavilion. – orange, translucent polyester sheets held up by two steel pillars. Inside the building you would have found a huge self-service cafeteria serving up to 200 people at a time, stood or seated at high bar tables, a bar, a kitchen and a laundry. Upstairs was a café, dance hall and cocktail bar. The upstairs was accessed by staircases at either end of the building and the décor featured lots of stone and wooden - black terracotta tiles on the floor for instance and terracotta cladding and wood panelling in the rooms. The seating was made of metal and used rich dark blues and red colours in its cushioning while marble and mahogany were also used reflecting the funding which the project received and which allowed it to bring in the best available designs and equipment available in the Eastern Bloc. The second element was the large triangular section to the left. The architects were given this plot of land which only really allowed them a single front onto Monte Cassino but also gave them a narrow strip of land on ul. Grunwaldzka set next to an old residential building. The architects decided to use the steep sloping roof of the neighbouring building as their guide and came up with this rather striking building which even today still serves its original purpose as flats and offices. The building also benefitted from huge neon lights, which were so popular the time and a huge ALGA was lit up on the side of the residential section. The building was finished with two mosaics made with neutral coloured tile and glass and designed by Maria Leszczynska. 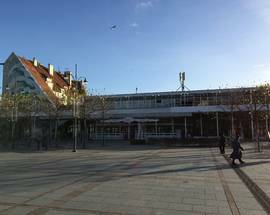 Alga quickly became a Sopot landmark and postcards of the period demonstrate how popular and recognised it was. Which is why it is saddening to see it in its current sorry state. A lack of care and investment have seen it become uglier and more miserable over the years. Long gone are the signature roofs and neon lighting and the original open spaces have disappeared as the building has been split into smaller units. Even one of the mosaics was removed when a new staircase was put it. It’s now a mix of regularly changing bar and club businesses. After years of rumours that the building was just a final summer away from being demolished to make way for a development similar to that opposite, the city authorities have made attempts of late to get the place cleaned up. They have asked the owner to return the building to its original look by putting back the orange plastic roofing, repainting the building in its whites and greys and by opening up the terrace on the ground floor. The owner has promised to make improvements but little has changed so far. We have to hope that the building is given a facelift as too many of these old buildings have been pulled down, to Poland’s loss in our opinion. As those who have visited the Warsaw Central train station of late will know, it is possible to retain a communist era eyesore and even give it a makeover. We dare say it’s even possible to start to love some of these old commie buildings once again.